Mike Dorsey started drawing at a young age, decades before acceptance at the Rhode Island School of Design. So, it is little wonder that having won National and International Awards for animation, including having been nominated for a Student Academy Award and studying with Chris Van Allsburg, the well-known children’s book artist/author Polar Express, Jumanji, that his work is steeped in storytelling. Mike lives and works in the beautiful marshland town of Ipswich, Massachusetts. He had a glorious childhood as an “Air Force brat” living in six states east of the Mississippi River. 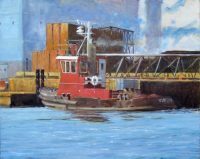 He is an award winning, artist member of the North Shore Art Association and a member of the Newburyport Art Association. He is winner of the Charles C. Gruppe Award Excellence In Marine Painting; a Juried Artist, in the Parrsboro Plein Air painting competition, NS, Canada; a Juried Artist, Castine Plein Air Paint Festival; Juried Artist for the Annual Cape Elizabeth Paint for Preservation; Juried Artist in the Annual Crane Estate Art Show;a Juried Artist Essex County Greenbelt Association’s; Juried Annual Art in the Barn; Juried Artist for the Annapolis Plein Air painting competition. His work is in collections in the US, Canada and Europe. He is represented by Zanobia, Ipswich, MA and in 2018 was accepted into the 39th International Marine Art Exhibition at the Maritime Gallery at Mystic Seaport Museum, Mystic, CT.